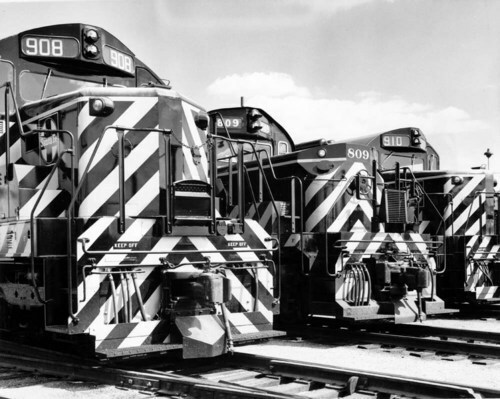 This photograph shows two newly delivered Electro-Motive Diesel (EMD) SD24 roadswitcher engines (# 908 and # 910) and one American Locomotive Company (ALCO) RSD 15(# 809) at the Atchison, Topeka, & Santa Fe Railway Company yard in Argentine, Kansas. All have zebra stripe paint. The photograph was taken by Orville Brent. Atchison, Topeka, & Santa Fe Railway Company yards, Argentine, Kansas.